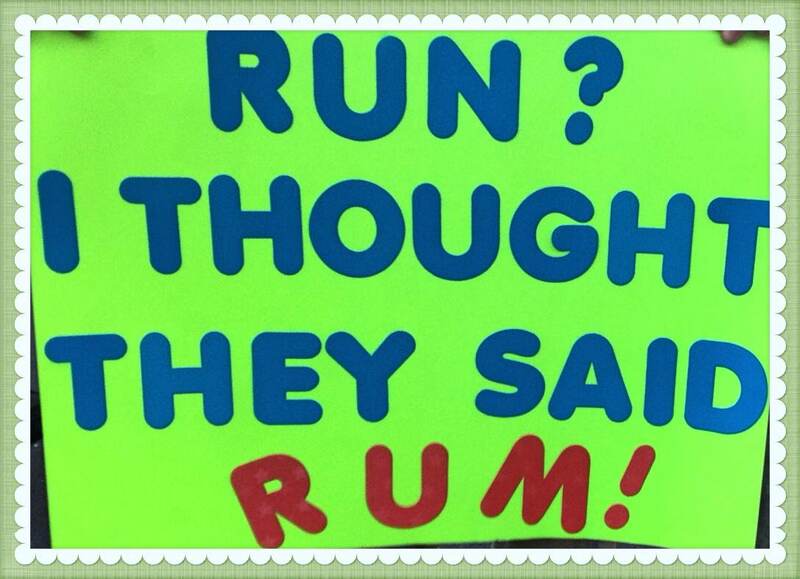 When exactly does the marathon start? I must admit, I keep my eyes open when it comes Run Disney information. As well, I read multiple Facebook pages devoted to the events to keep informed on people’s opinions and travel plans. As much as I benefit from others’ insights in terms of helpful tips, some of it has started to wear me down and here’s why…. People are reserving Disney World and local Disneyland hotels prior to registering for a race 9-10 months out. 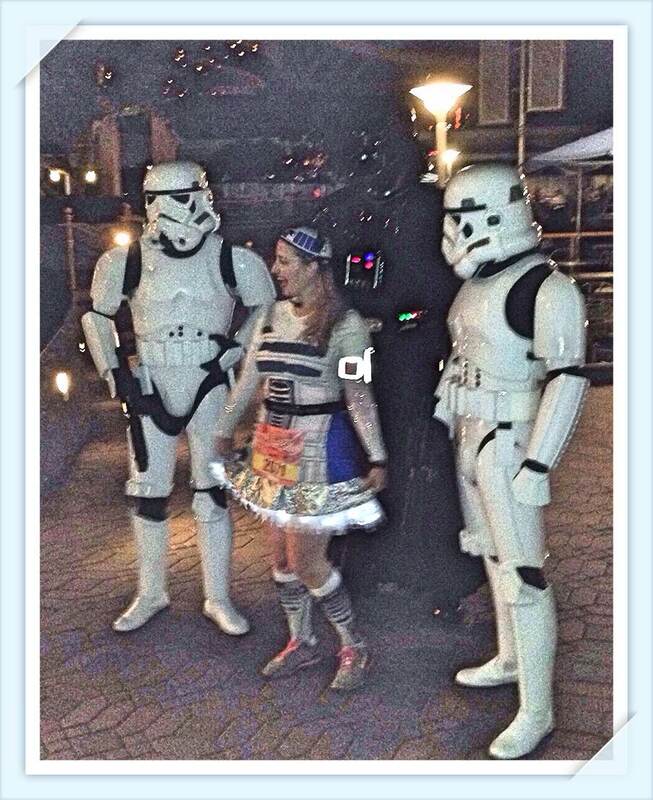 Despite the fact that Run Disney offers special packages for participants after registration begins. I’ve read multiple people have already booked their hotel and flight for the Wine and Dine in November, and registration doesn’t open until March 4, 2014. 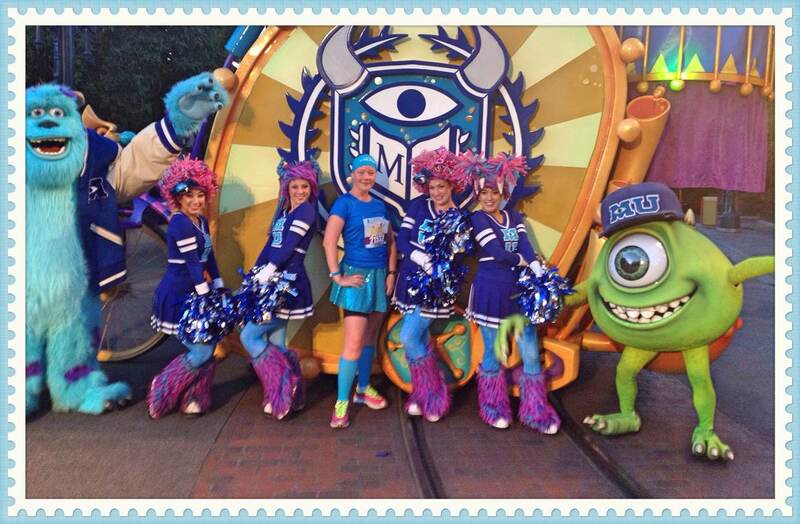 Registration for Run Disney events go online at their designated day and time and some sell out within an hour. Sure, I have plans for 2015. 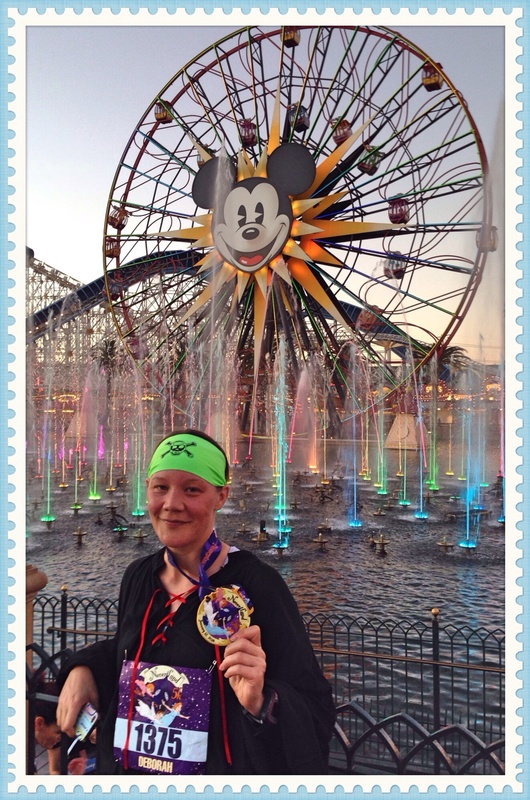 I am hoping to register for a Dopey Challenge repeat, as well as other Disney events. Have I started to plan for it? In my mind I have. Given the current environment which seems madder than a Mad Hatter, I’m starting to write down budgets, research hotels, figure out accommodation plans and search out current prices for airline tickets. This is all for 2015. I haven’t even thought about this year’s vacation. 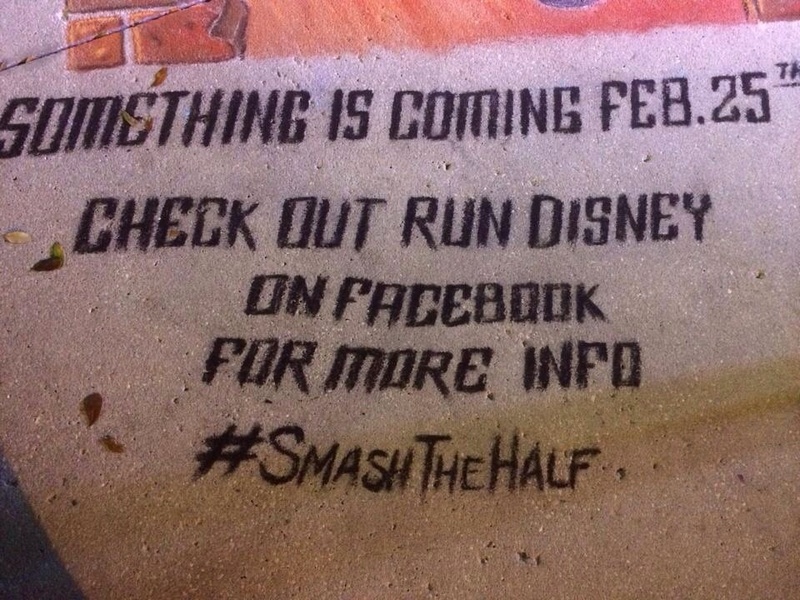 But then again, I don’t have any more Disney races planned. I almost feel like Mr. Rabbit. I’m late! Do I need a plan of attack? I think I do. I’m starting to feel like I’m at one of those crazy bridal gown sales where all the brides stand at the front of the store, in anticipation; waiting for the guard to let them attack run and stock pile the multiple racks of gowns, looking for a deal on a wedding dress. With no guarantees that by the time I get in, I’ll find my perfect dress. Or any dress for that matter. This to me, is true TERROR! I’ve started to realize, the marathon doesn’t start at the time of the race. The marathon starts months in advance during the registration process. It compels me to take a vacation day off work, so that I am sitting at my home computer, waiting for hunting season to begin. aka April 22nd at 12pm EST. Must channel my inner Merida. With my bow cocked mouse in hand, I’ll shoot click off rounds of information and hope that the URLs click seamlessly without hesitation. Who knows what craziness could unfold when thousands of people are registering on a site at the same time. I hope I hit a bullseye! In the spirit of the Olympics, registration is almost a qualifying event. You can’t go to the big event unless you train-and I’m not even referring to actual running itself. Check your equipment. Internet working ok?-not the right time to forget paying a bill. Ensure you’ve trained on the race course, AKA: know how to navigate on active.com. Wait for the gun to go off-12pm EST/9am PST. READY! SET! GO! If you qualify, you make the podium. 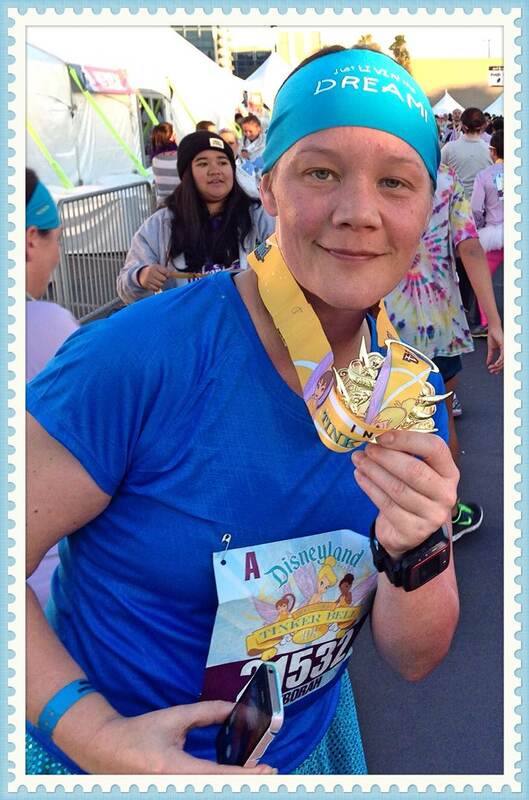 We all get medals for finishing a Run Disney race. Ahh…Countdown begins. 65 days to GO TIME! KEEP CALM AND PLAN YOUR REGISTRATION! Any one else having sleepless nights over registration? How early are you booking your travel plans? We were ready. More than ready. 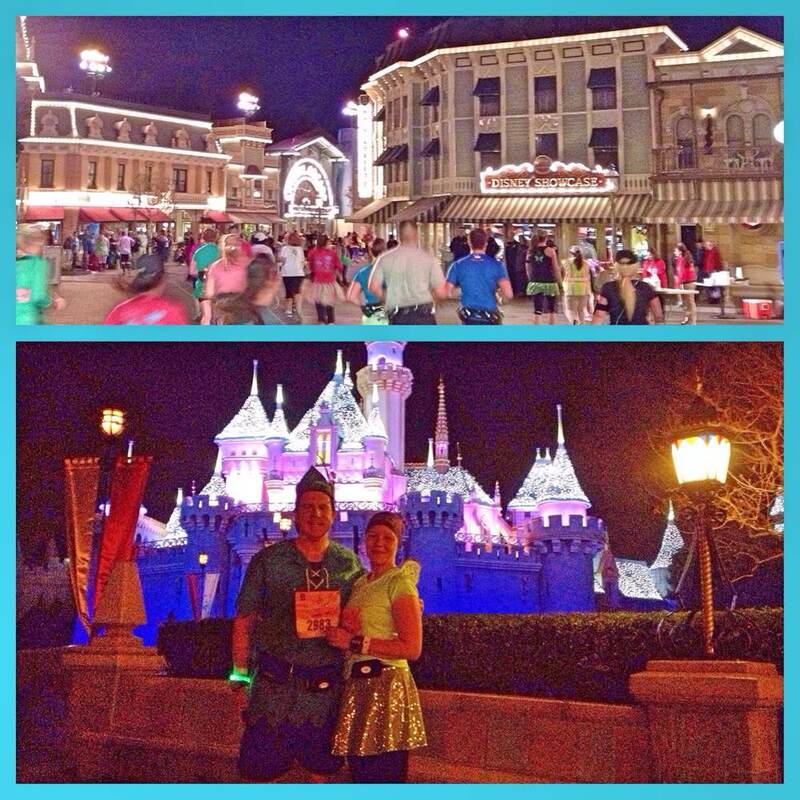 We found our sleepy selves in Corral B. Kari went as Peter Pan, and I had on my Tinker Bell wings. I liked these wings as they were meant for kids. Not too big so they didn’t flop around. Powered by pixie dust, (as my Bondi band said so) I was ready to go! 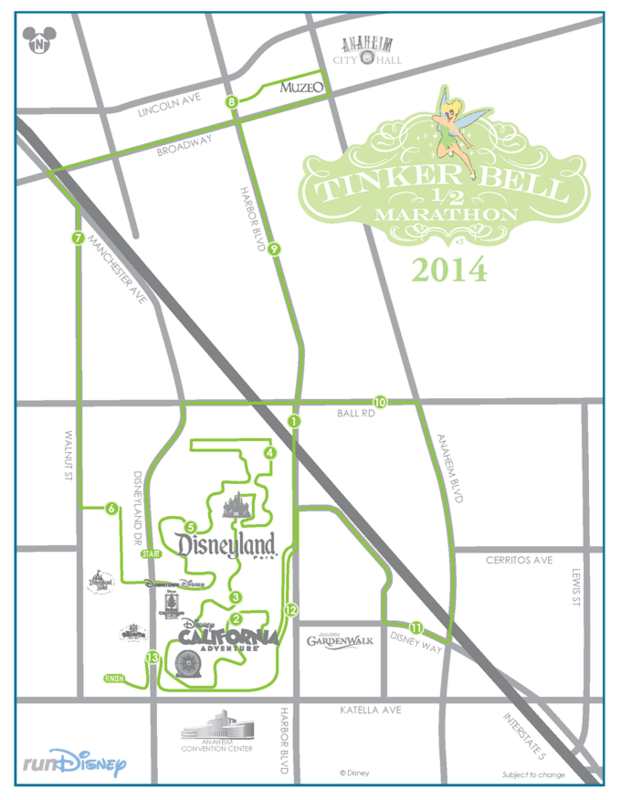 We started the race on Disneyland Drive, with a short portion on Ball Road to Harbor Blvd. Before we knew it, we entered California Adventure. It was pretty dark so we didn’t stop for too many photo breaks. 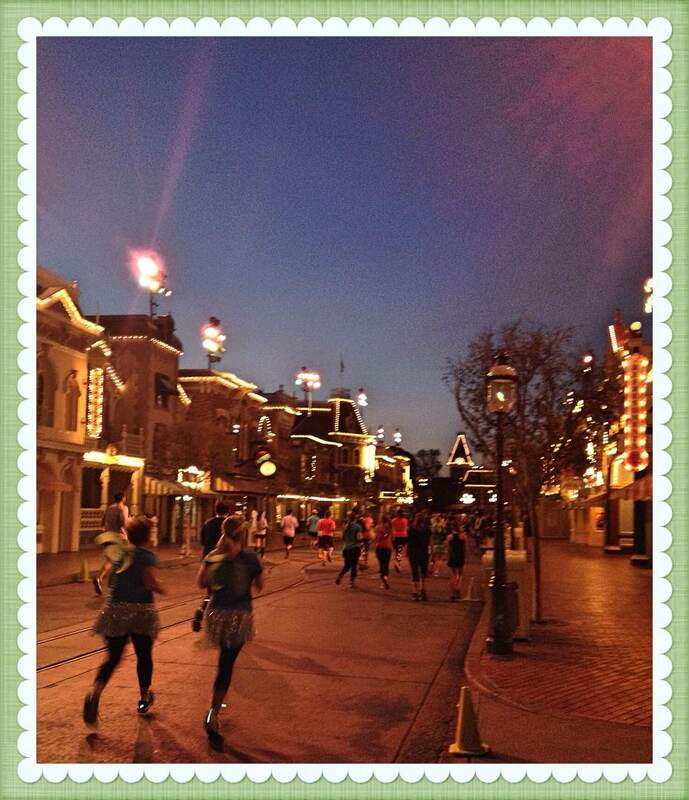 Most of which were repetitive from previous days, so we kept running towards Disneyland’s Main Street. Along the way, we came across a few familiar faces. 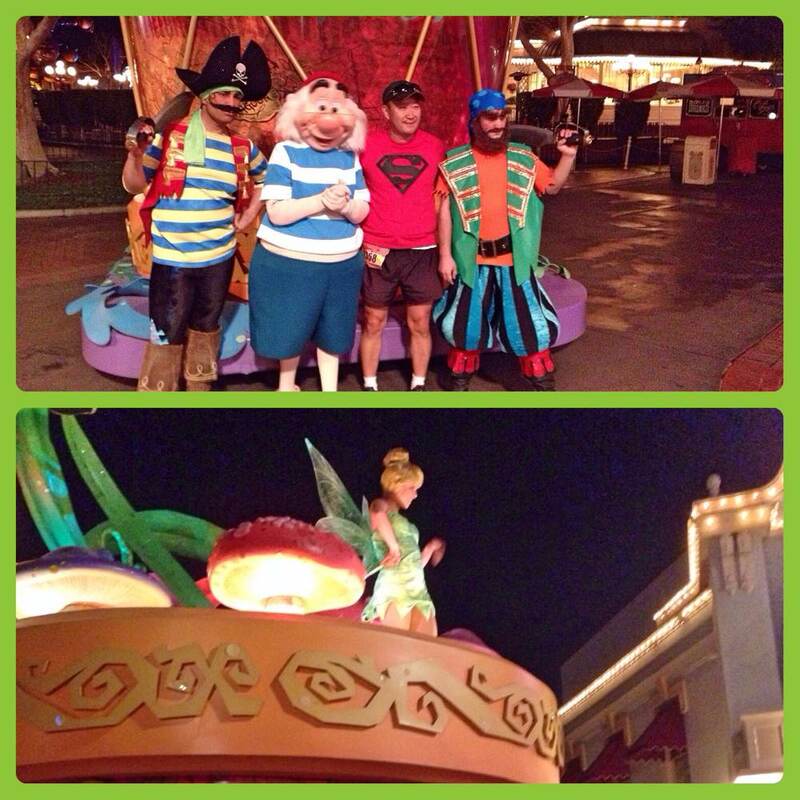 Tinker Bell, Pirates and Smee, Oh My! We ran down Main Street and stopped briefly for a picture outside the castle. Unlike the previous day, the castle lights were on which was pretty awesome. It wasn’t too long before we ran through the castle and then ran into a few Lost Boys. Now, this guy was pretty close by, so I’m sure he kept a watchful eye on those crazy kids. Our next stop was at It’s a Small World. Again, this is one of my favourite sights in all of Disneyland, so I had to stop and take a couple of pictures. 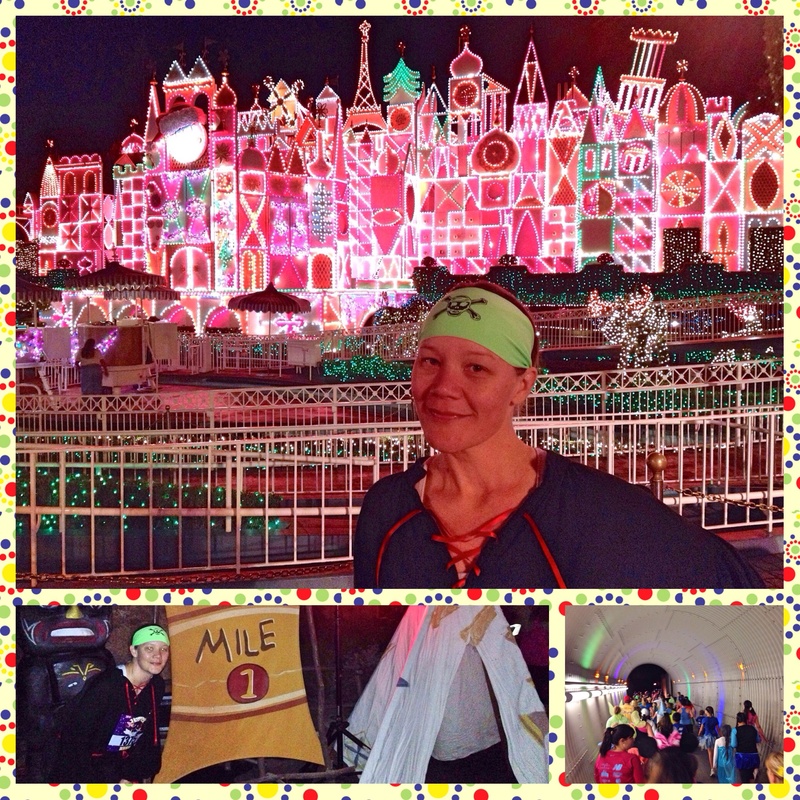 We finished up running through Disneyland from mile 4 to 5 going through Fantasyland, Frontierland and I think a bit of New Orleans Square. Before we left we found these characters. Our next stop was Downtown Disney. 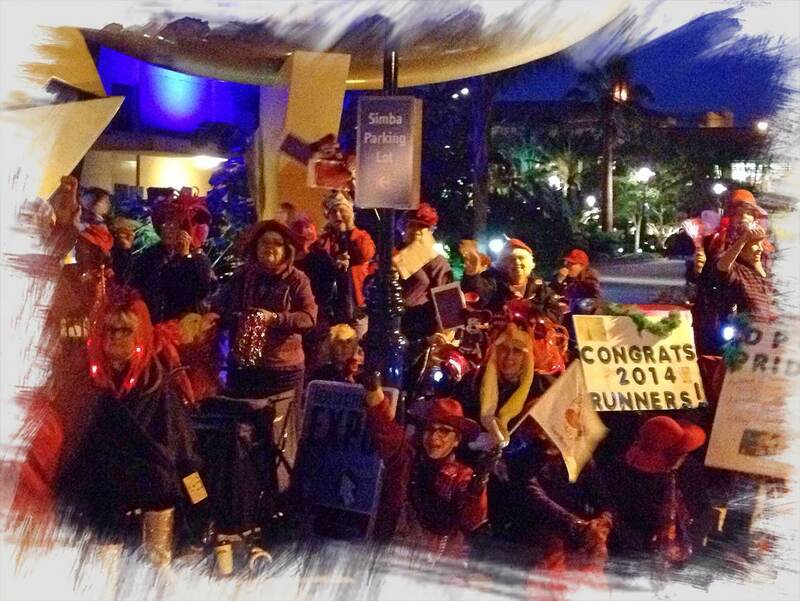 Downtown Disney is where the infamous Red Hat Ladies cheer on the runners. 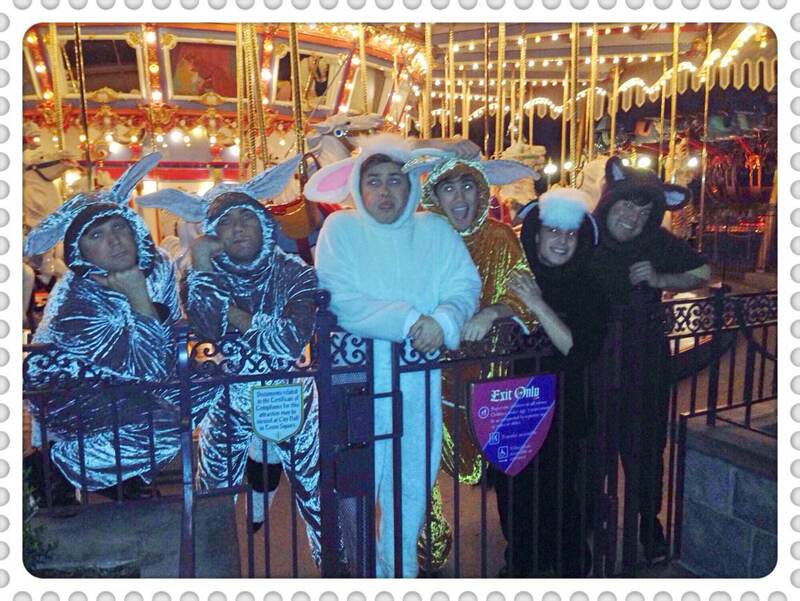 I have no idea how this began at the Disneyland races, but their group sure seems to grow in numbers year after year. Any runner who passes by them was sure to have gotten a jolt of energy. After mile marker six, the course changes, and we find ourselves running on the quiet (and not so quiet) streets of Anaheim. Some would say it’s the boring part of the course, however, I quite enjoy it. A part of it is residential housing, so it can be quiet, but on the more busier streets, there are numerous marching bands and cheer squads to get our energy pumped. 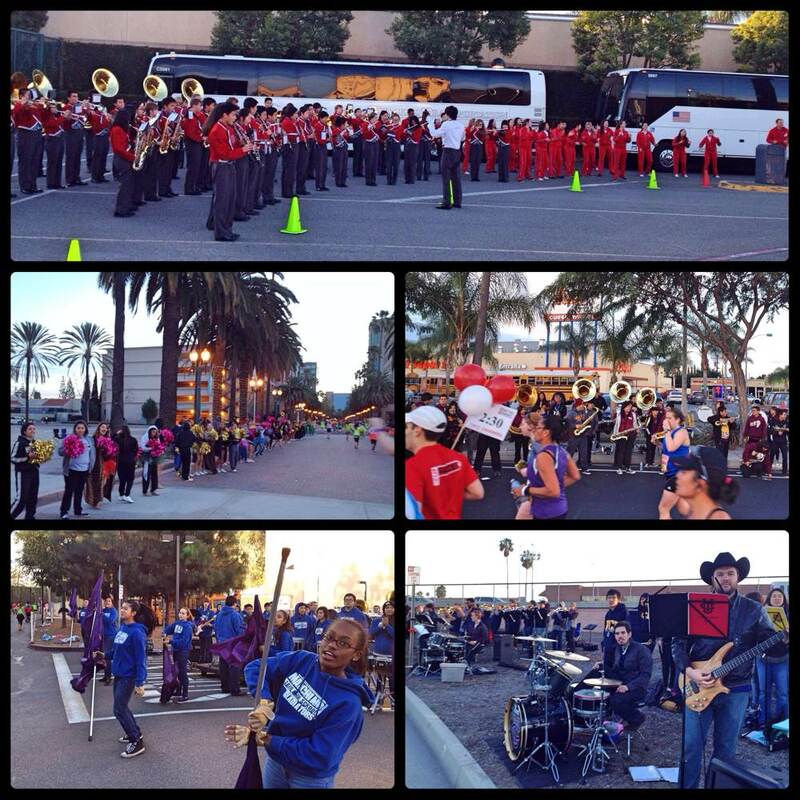 I like a good marching band, and these groups are really fantastic. If you happen to be using video as you go by, most will give an extra special loud cheer. They are a very energetic bunch. Here are some of the sights of Anaheim. The time really flew by in the second half. Before I knew it, we were coming up to the finish. I was really pleased with our times given all the stopping we did along the way for pictures. As well, this was our 7th race in the last 11 days. One would think our times would be much longer, however, next to the 10K the day before, our time on the half was second best. Who knew? Our chip time was 2:36:35 and my place overall was 3412/11490. 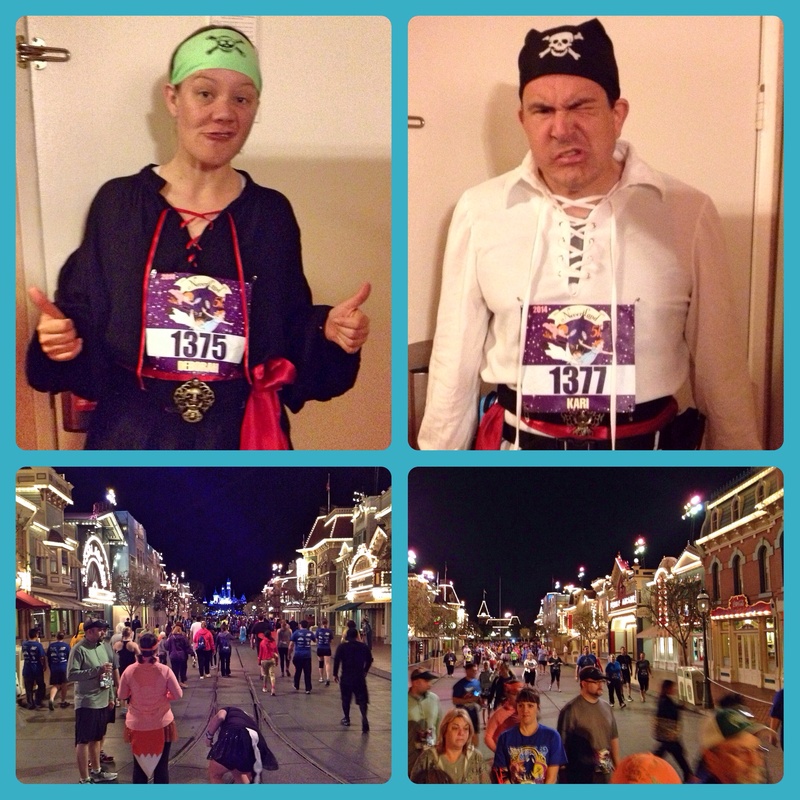 Not my best time, but a decent time for a Disney race. 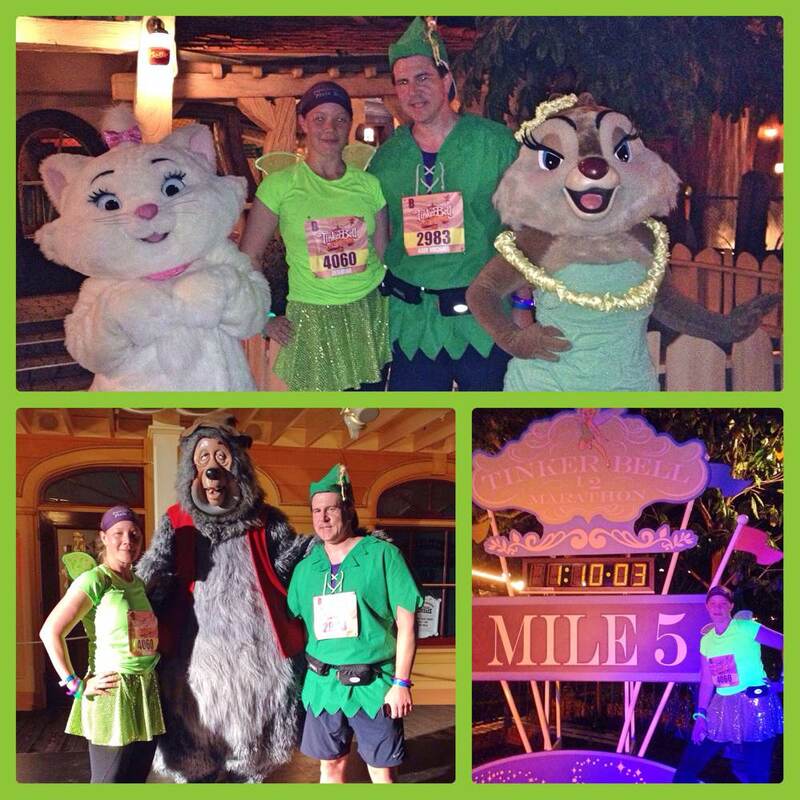 On a side note – This was the last time the Tinker Bell race weekend was to be held in January as it’s moving to Mother’s Day weekend for May 2015. 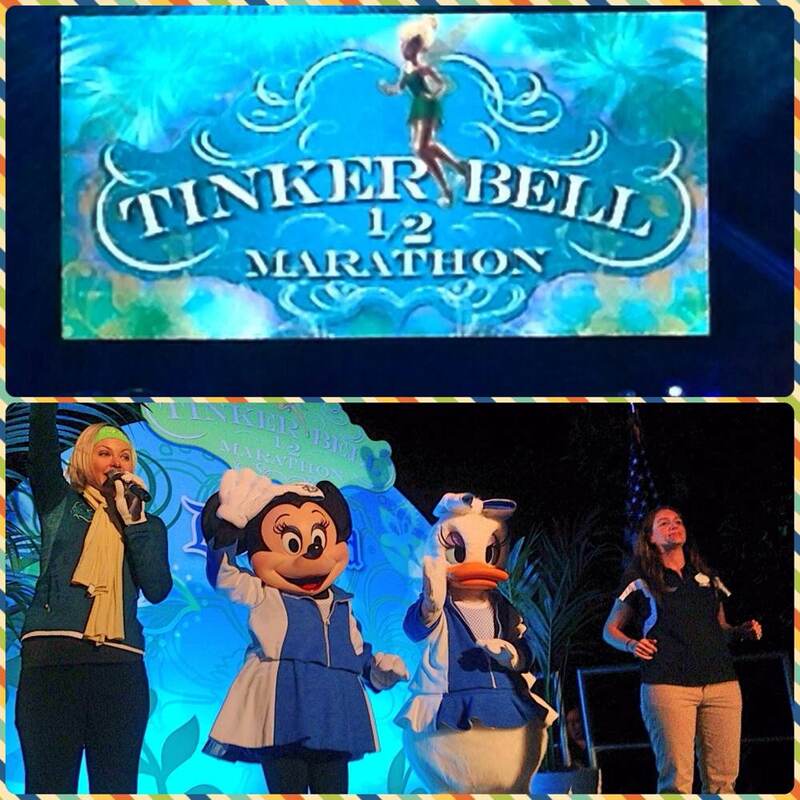 I suppose this enables other runners who have opted for the Walt Disney World marathon weekend in January to perhaps consider Tinker Bell in future race plans. In it’s 3rd year, I’ve really seen it grow and become a popular race amongst the Run Disney family. 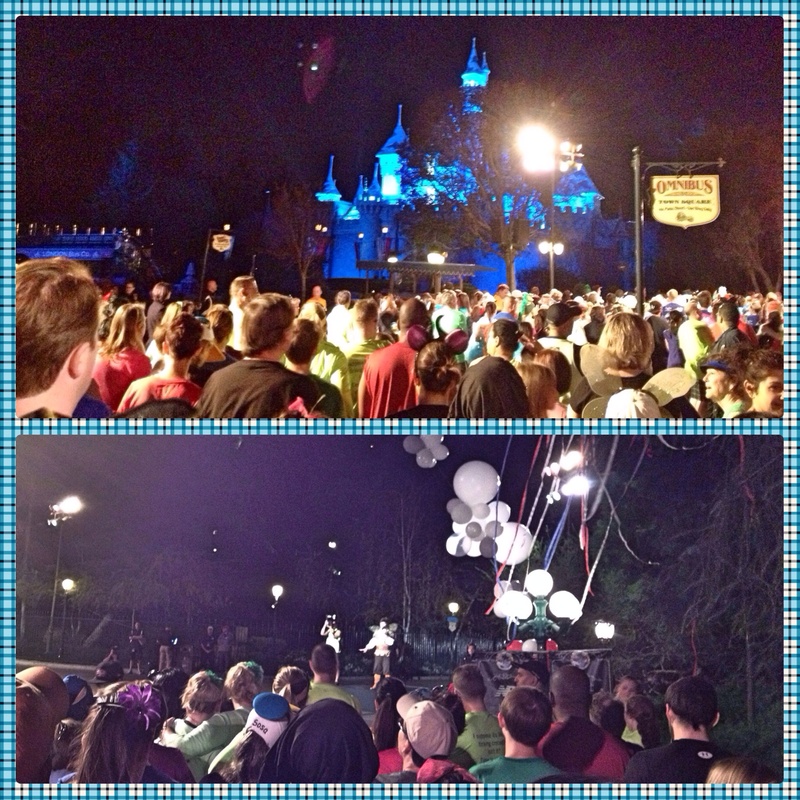 I can only see it gain in popularity and it’s a great addition to the Disneyland run schedule. 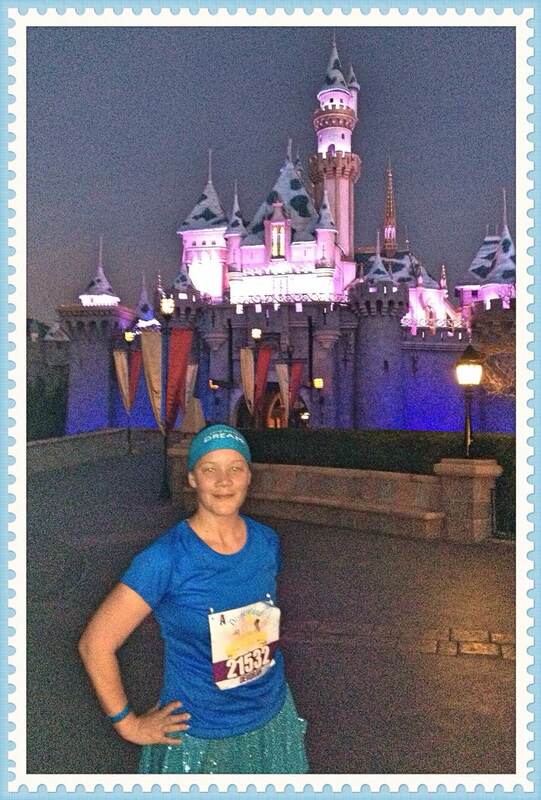 Until we meet again Run Disney, Happy Running. 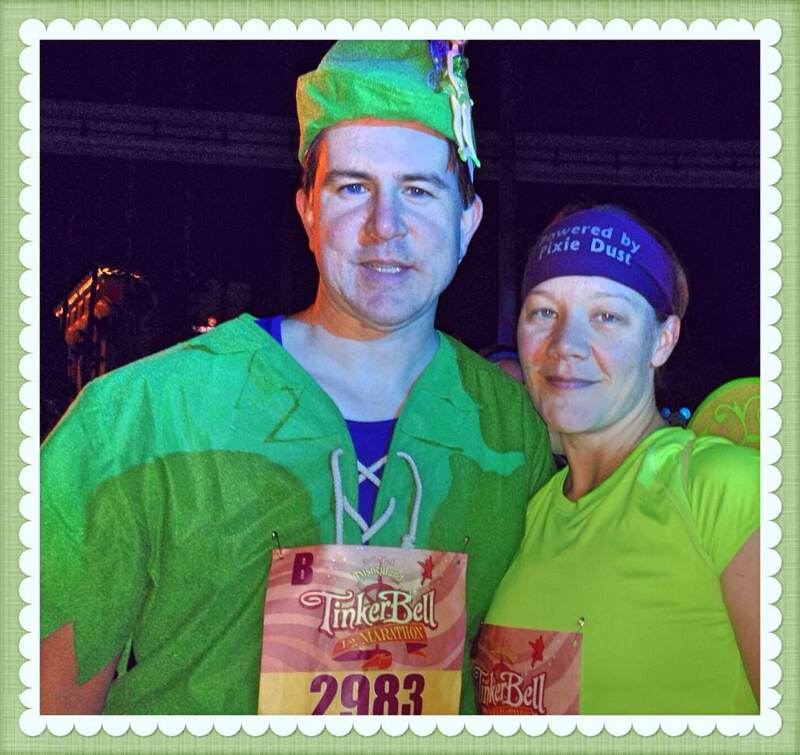 The inaugural Tinker Bell 10K started at 6am on Saturday January 18th. 15 minutes later than the 5K the day before. You know what that meant; 15 more minutes of sleep time. 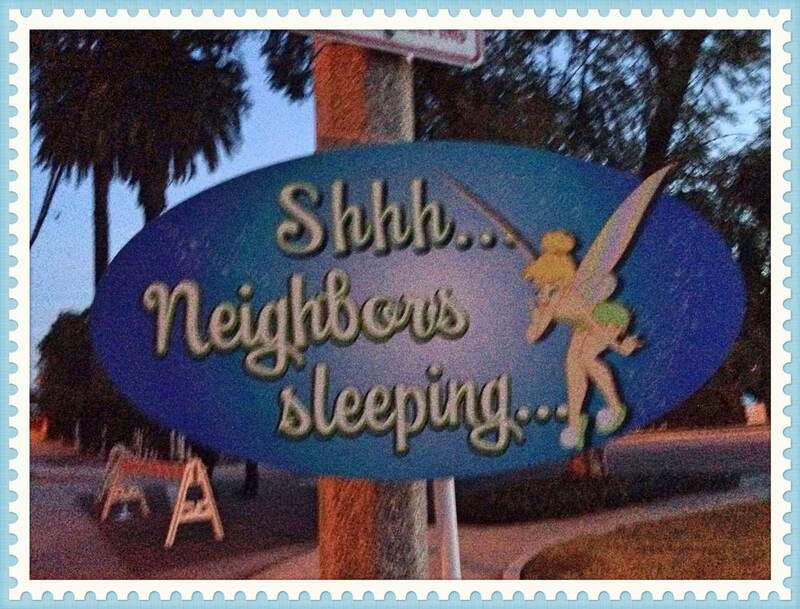 My inner Sleeping Beauty was really enjoying these later corral times. 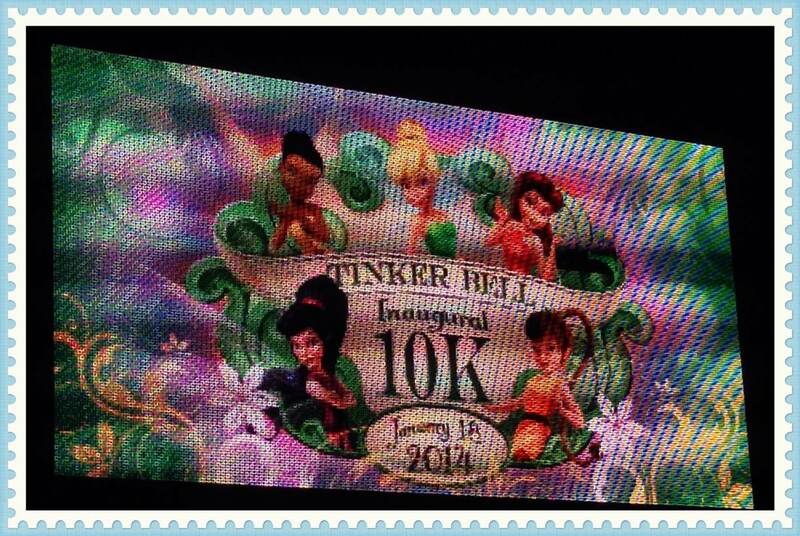 We were excited to experience the inaugural 10k for the Tinker Bell race weekend. 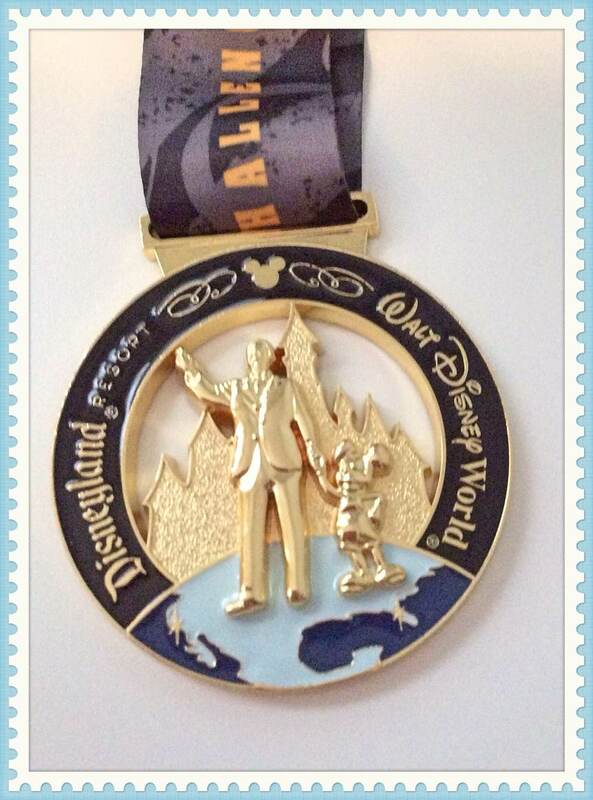 The only down side is that Run Disney didn’t market this as a challenge as they did with the Princess Glass Slipper Challenge (running 10K & half). Oh bother! We were happy to be a part of it. Perhaps in the future Run Disney will do something similar? 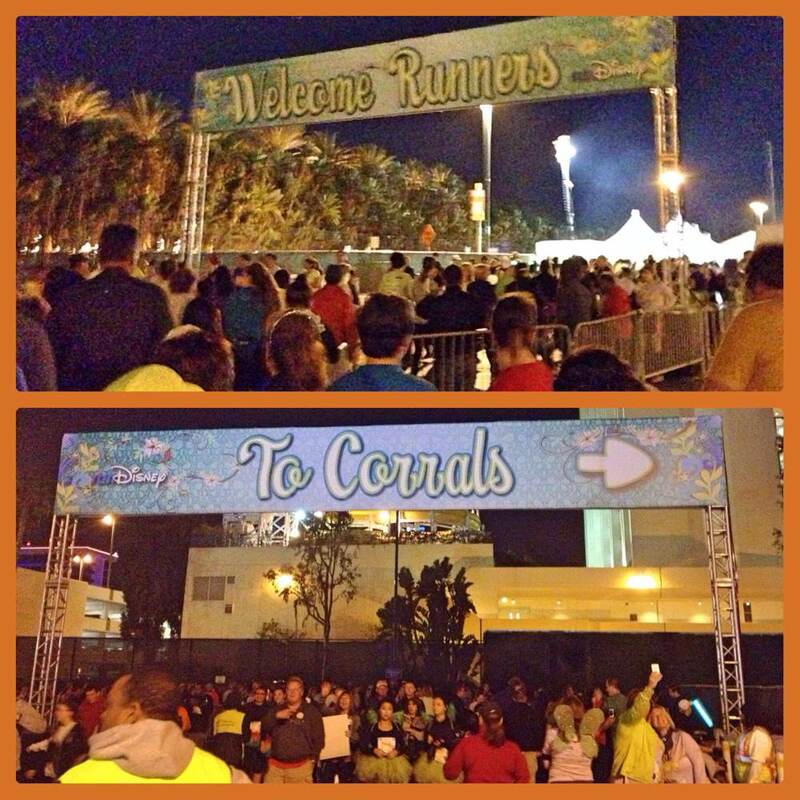 We left for the corrals around 5am. The short walk to Disneyland Drive to the start of the race was enough to shake out our legs. Upon arrival, we saw a path leading to the runner stage area with several tents, port-o-potties, race information and lots of volunteers. We continued on the road as we aimed to find ourselves in A corral. Biding our time before the race. In our corral above, there was a big screen indicating we had arrived at the correct place. Big Screen – We knew where we were, whew! 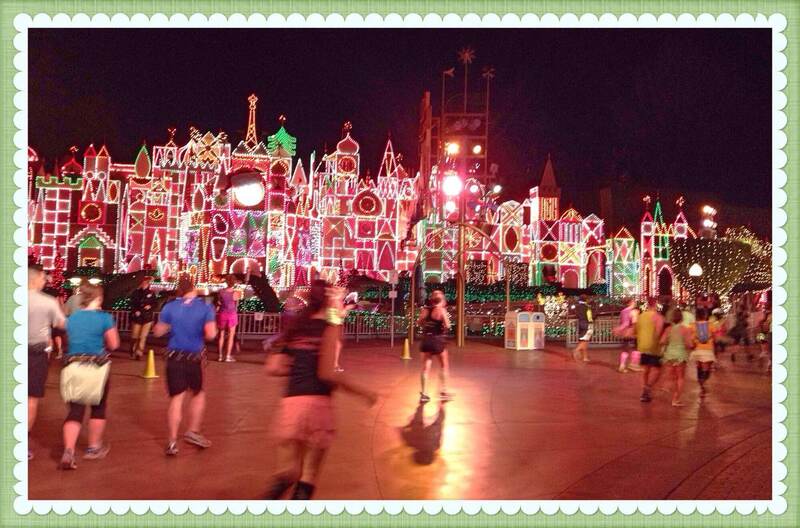 Once the race began, we found ourselves running on Disneyland Drive towards the backstage, then onwards around It’s a Small World, Mickey’s Toontown, Critter Country, Frontierland and then around Fantasyland. 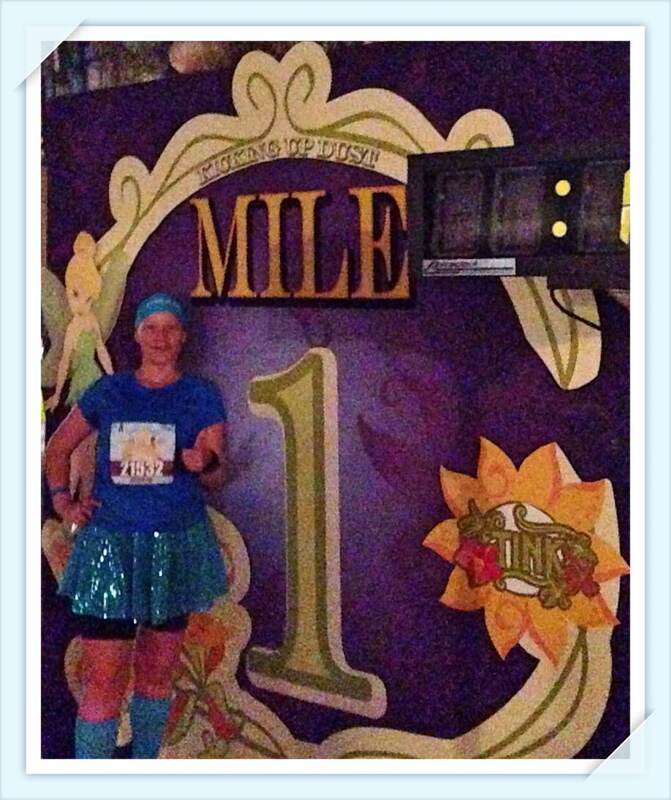 Mile 1 – Only 5 more to go! Front of Sleeping Beauty’s Castle, and onwards down Main Street. We entered California Adventure at the main entrance and continued our journey to Condor Flats, and Grizzly Peak areas. 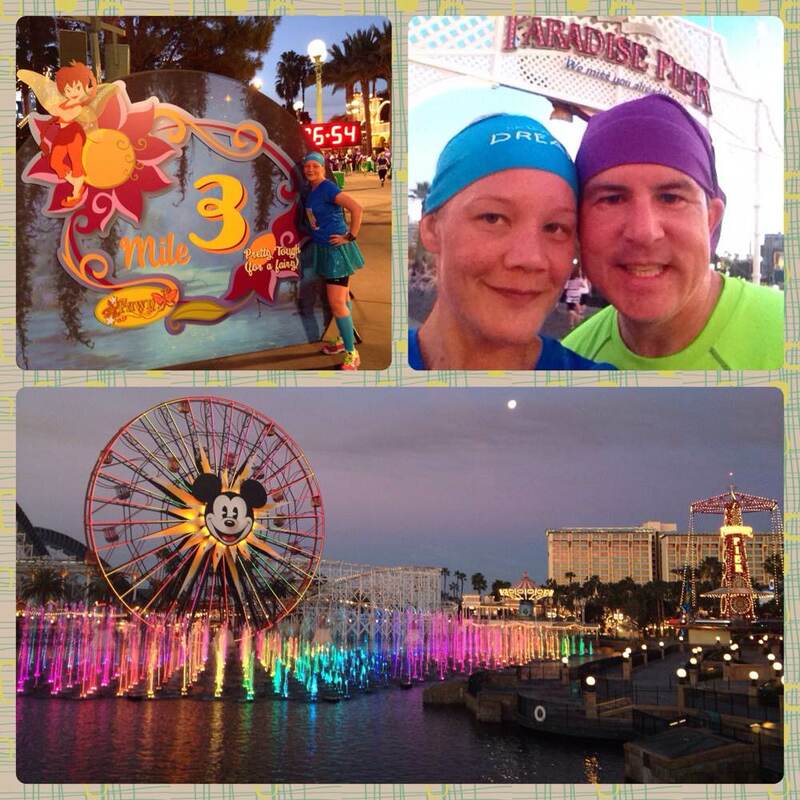 Soon we arrived at mile marker 3 as we were coming towards Paradise Pier. A perfect time to stop and take a few photos. 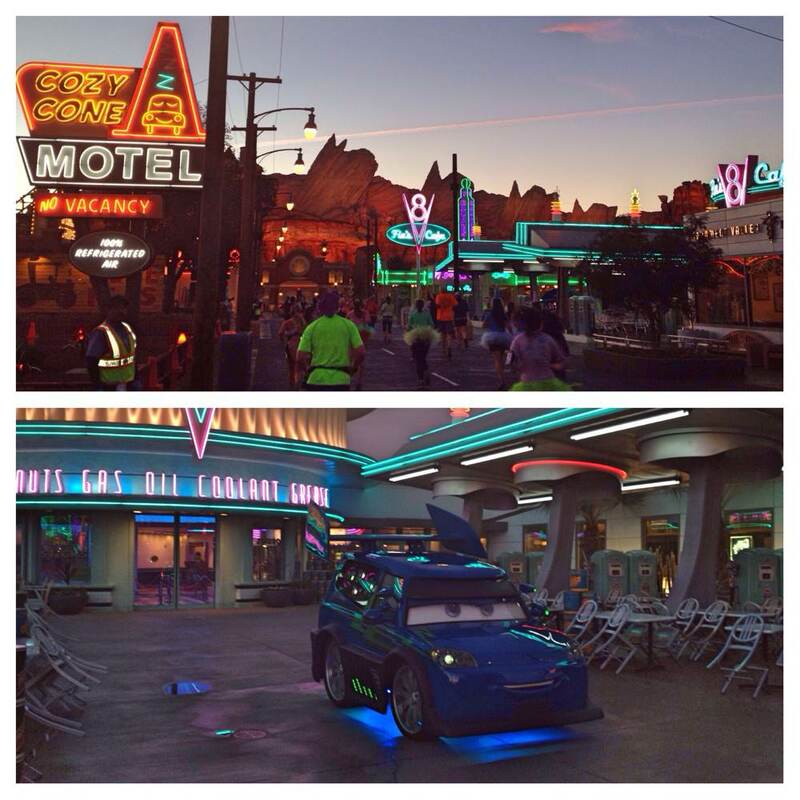 Soon after we were deep into Cars Land passing by the Cozy Cone Motel and Flo’s V8 Cafe. Unfortunately, this is where I was almost taken out by an overly revved up Car runner, who decided to suddenly cross in front of me. I got lucky and I shifted into first gear before I ran into him. Whew! The last part of California Adventure was through Hollywood Land and then outside, onto Harbor Blvd for the last two miles of the course. 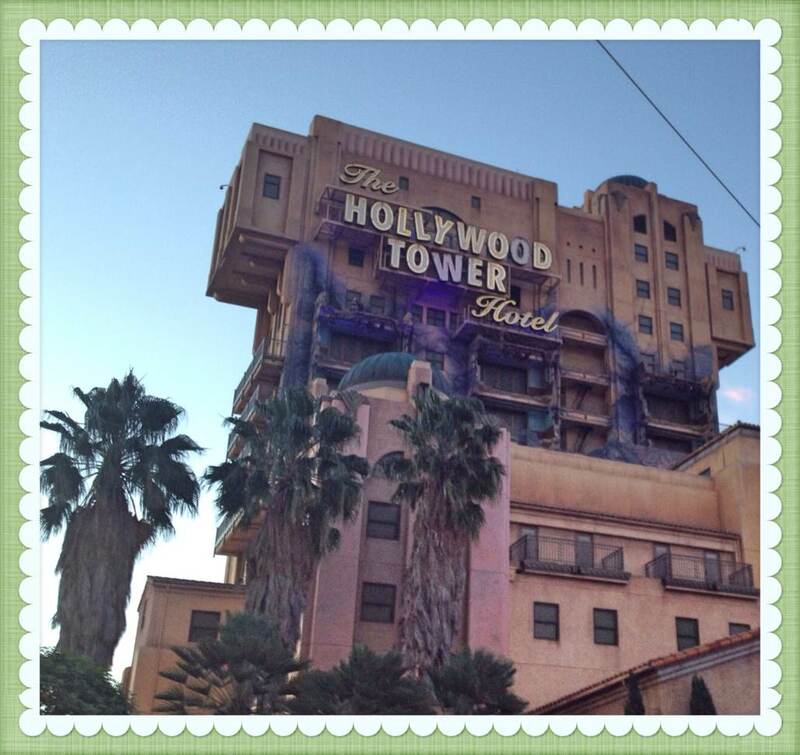 I can’t remember if I saw Mike and Sully first or the Tower of Terror first. In any case, both of them were within short distances of eachother. I think I fit in here! 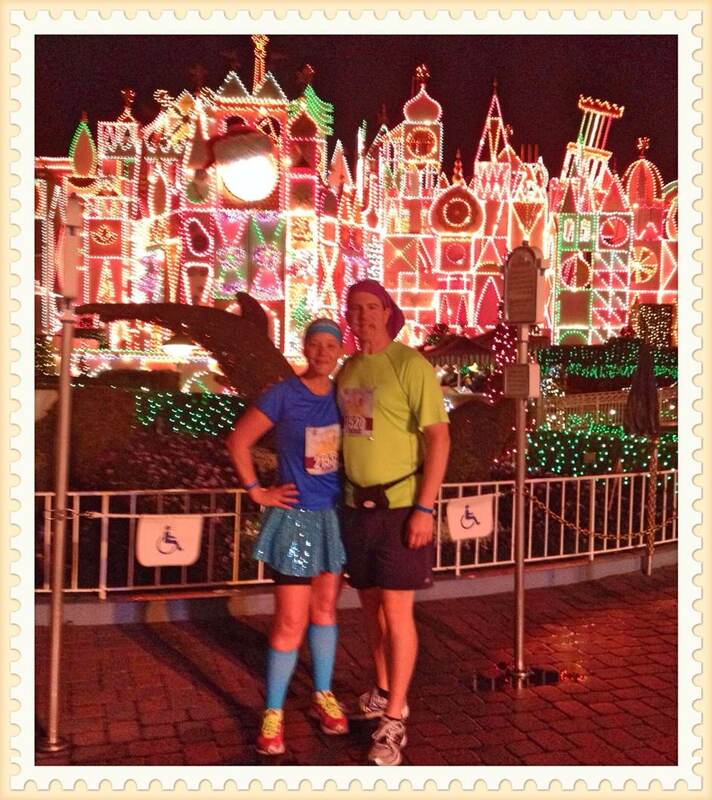 Soon enough, we found ourselves outside of California Adventure at mile 4. 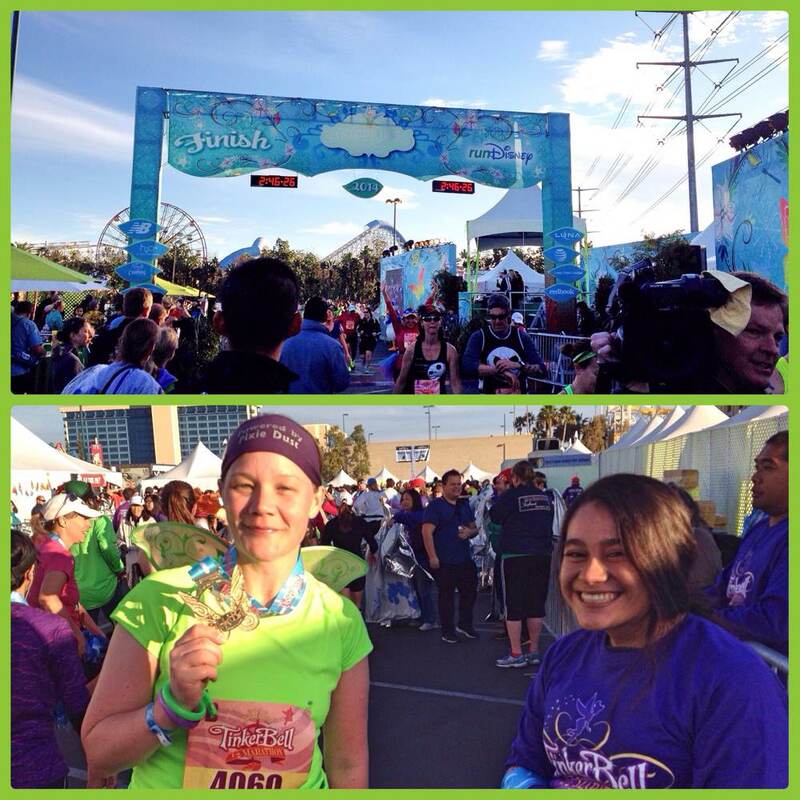 We had two more miles along Harbor Blvd, Disney Way and Katella Ave, to arrive at the finish. Hmm…Maybe if I was still a pirate? I have to say, I really enjoyed this course. We snapped tons of photos along the way and we took our time to really enjoy the sights. We still managed to get a decent time of somewhere around 1:13 for the race. 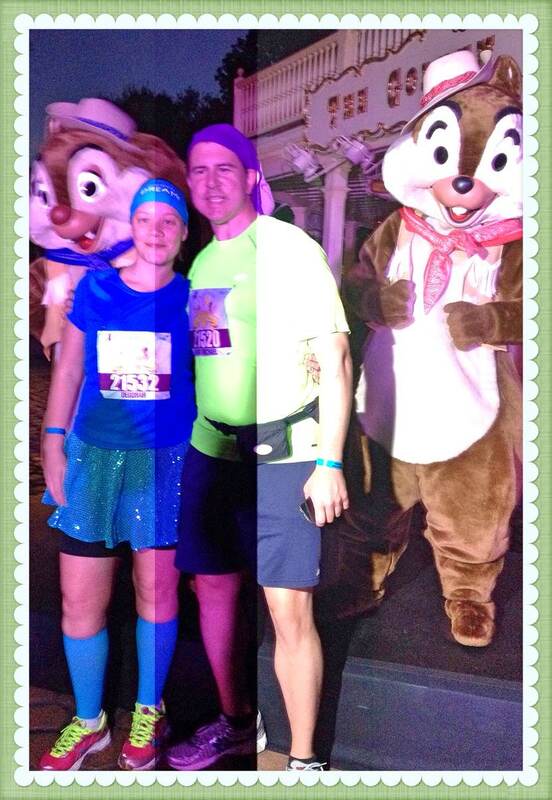 Not super fast, but given the stopping, we were much happier with this time over the WDW Minnie 10K which had tons of traffic. 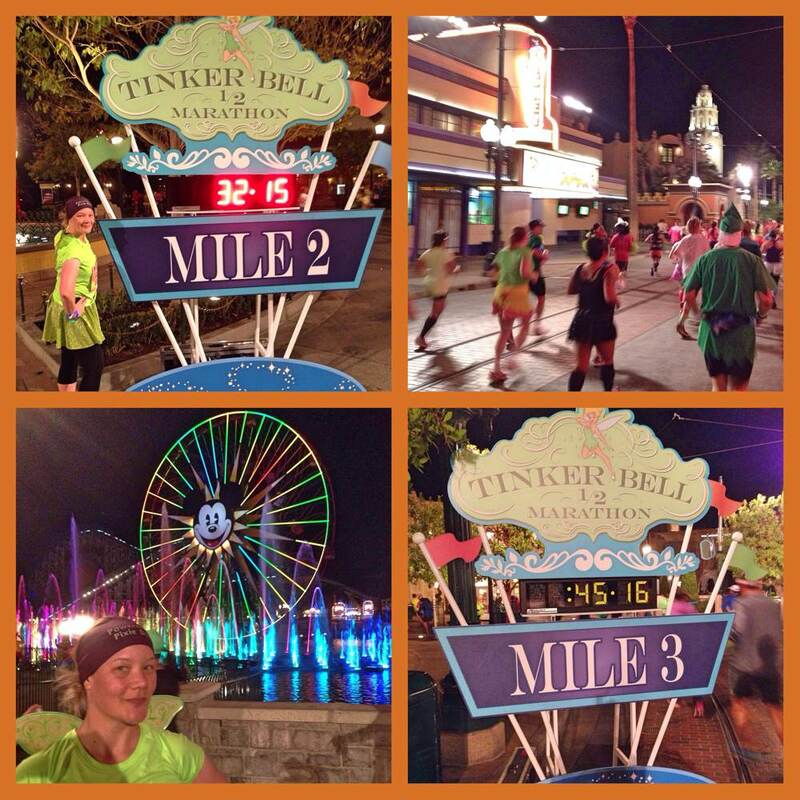 Next on the Tinker Bell Race weekend coverage – The Tinker Bell Half Marathon and race wrap up! 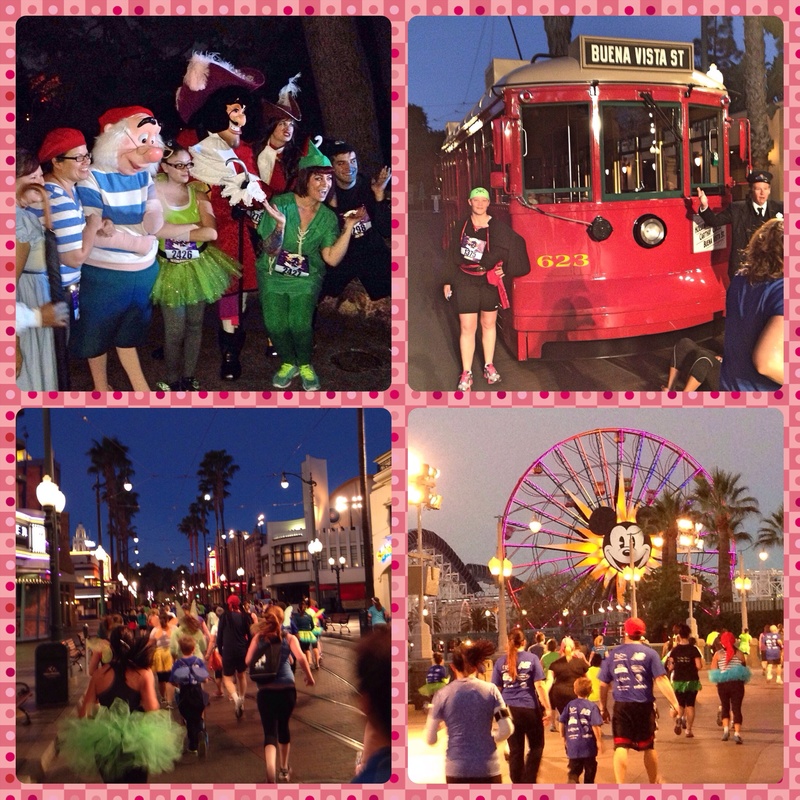 Friday January 17th kicked off our 3 day running spree at Disneyland. We were super happy we got to sleep in. Sleeping in meant we didn’t have to wake up until 4am. This was a luxury to us in comparison to Walt Disney World. 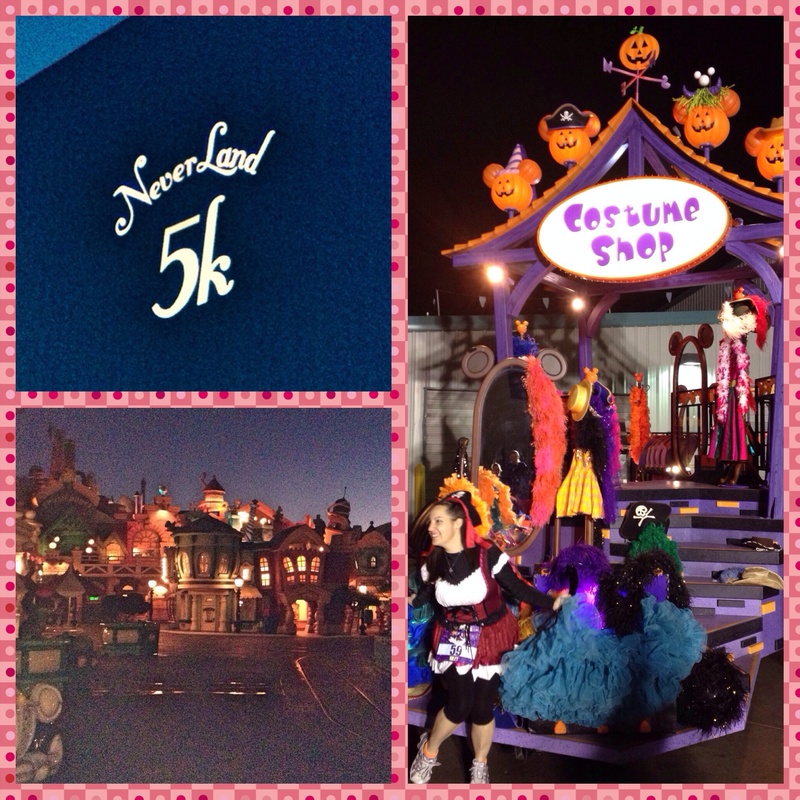 The Never Land 5k was to start at 5:45am so we made our way out our hotel door at 5am. It was a short walk across the street towards Main Street inside Disneyland. Participants made their way to corrals during this time. Although Disney does ask participants to corral themselves according to their pace, most don’t and upon arrival, seed themselves in the next available corral. When we arrived, we were able to place ourselves in C however we soon found ourselves stumbling to run once we began our race. I always enjoy the start of the race as they play the Disney theme song and Tinker Bell flys out of no where (or Never Land if you prefer). She is suspended on wires and zooms around the castle. Remember when you used to watch The Wonderful World of Disney on TV and Tinker Bell would come out and fly around the castle? It was kind of like that! Cool eh? Once we were off, we made our way through Disneyland. It was still pretty dark. Disney had some props out and we took a few pics of them as well as Toon Town. One of the fun photo ops was at It’s a Small World. It’s one of my most favourite visuals at Disneyland. Bright lights, big city? Nope, it’s just a small world after all. Once we made our way through Disneyland, we soon entered California Adventure. We made ourselves around Hollywood Land, Cars Land, Pacific Wharf and Paradise Pier. The Mickey ferris wheel and lights is always a wonderful sight. 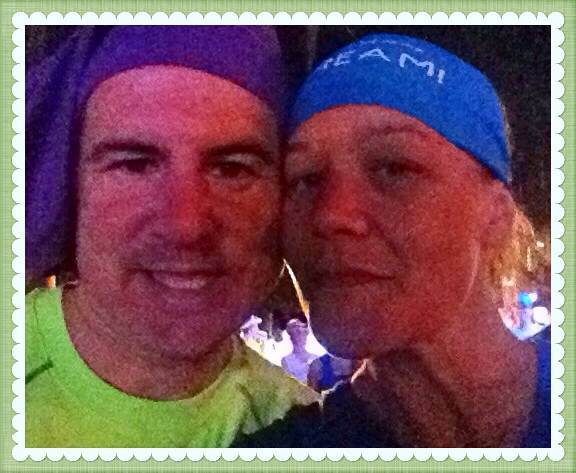 Soon we found the end of our 5k adventure. We received our medal and picked up our snack box and drinks. Before we left, we were sure to take a few celebratory pics over looking the water. All in a days work right? Really it was only around 7am. It was time to shower and change for our big day. We returned to the expo and then spent the rest of the afternoon at California Adventure. 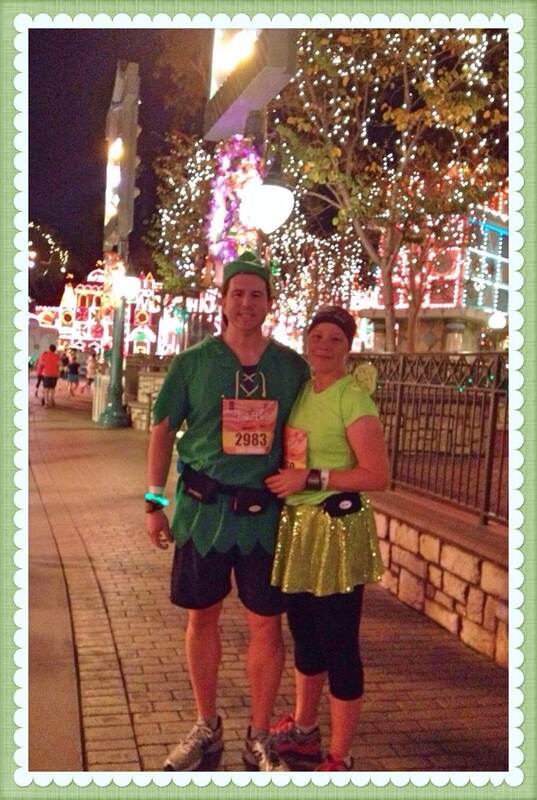 Next up on our Tinker Bell running trio – Tinker Bell 10K.